Enjoy the best inspirational, motivational, positive, funny and famous quotes by Alexander Carmichael. Use words and picture quotations to push forward and inspire you keep going in life! 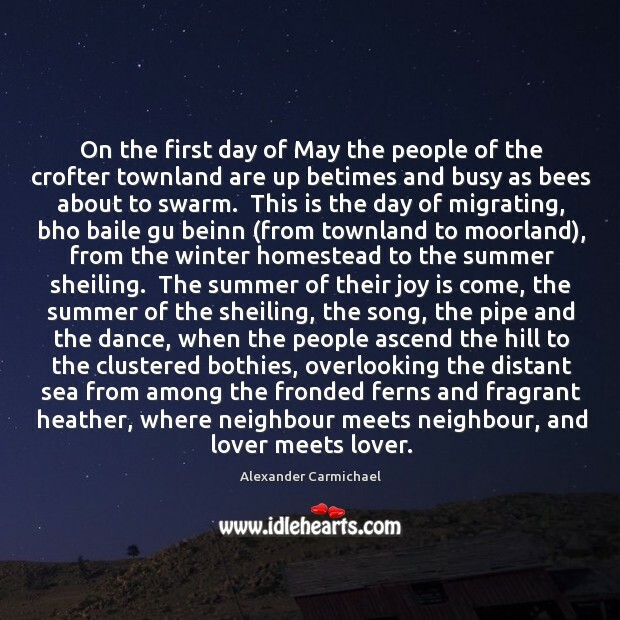 On the first day of May the people of the crofter townland are up betimes and busy as bees about to swarm. This is the day of migrating, bho baile gu beinn (from townland to moorland), from the winter homestead to the summer sheiling. The summer of their joy is come, the summer of the sheiling, the song, the pipe and the dance, when the people ascend the hill to the clustered bothies, overlooking the distant sea from among the fronded ferns and fragrant heather, where neighbour meets neighbour, and lover meets lover.